iPad is the next gen device launched by Apple in 2010. Even though there are many apps in the market for previous Apple devices such as the iPod Touch or the iPhone, there is a need to create new apps for the iPad device as well. But what about those applications that are immensely popular and used far and wide? The solution to this is – iPod/iPhone Application Migration to iPad adhering to the technological functions of the latter. Owing to its exceptional features such as – 9.7 inch LED-backlit display, high graphics, the Apple A4 processor and a greater storage capacity, iPad provides an even greater opportunity for variety of application development than the iPod or iPhone. In fact, you can extend the functionality of your existing app via iPod App Migration to iPad and iPhone App Migration to iPad. We have an assorted team of expert iPad app developer who not only generate innovative iPad apps, but also are responsible for the flawless iPod Application Migration to iPad and iPhone Application Migration to iPad owing to extensive experience in iPod and iPhone applications. Take maximum advantage of the iPad features for your apps using this service wherein our developers make changes in the apps to conform to the technological aspects of the iPad. 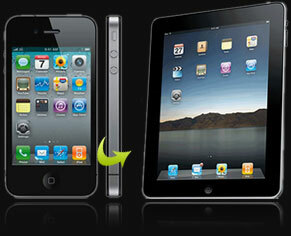 Also, we are responsible to customize your apps before we migrate iPhone apps to iPad or migrate iPod apps to iPad. Be it your business needs or personal, we assure you optimized transfer of apps to your iPad so that you enjoy them on this device.